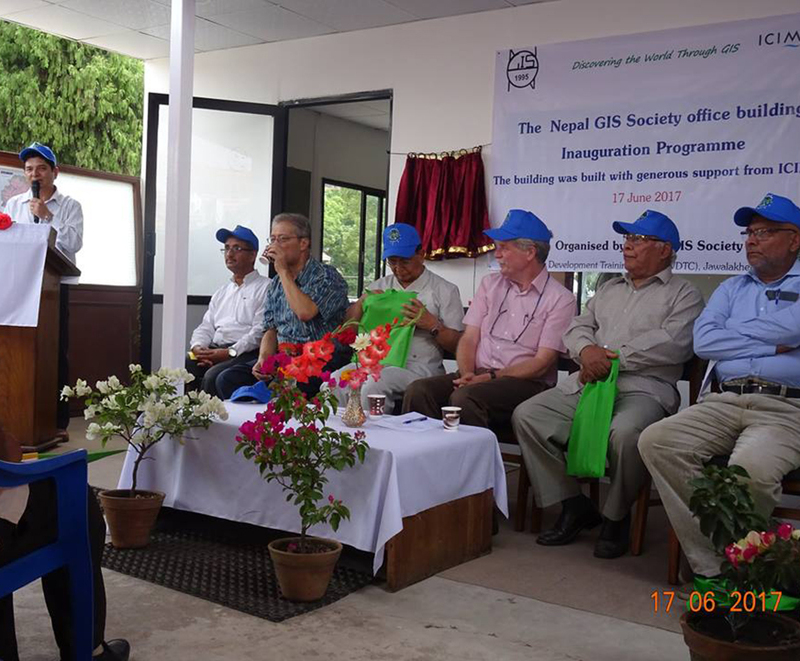 David Molden, the Director General of the International Centre for Integrated Mountain Development (ICIMOD), inaugurated the newly constructed office premises of the Nepal GIS Society on 17 June 2017. The office space is housed at the Women Development Training Centre (WDTC) inside the Local Development Training Academy (LDTA) Complex in Jawalakhel, Lalitpur, Nepal. The Nepal GIS Society reconstructed the office space with generous support from ICIMOD and well-wishers. Advisors, members, and senior geo information (GI) professionals, and scientists, students, and representatives from government organizations attended the half-day event. Krishna Poudel, the president of the society, chaired the programme. Welcoming guests to the programme, he highlighted the activities of the GIS Society. He thanked Molden for the support provided by ICIMOD as well as his personal contribution towards the reconstruction of the GIS Society workspace. Poudel also thanked LDTA and WDTC for accommodating their request to construct their office building at the latter’s premises. In his inaugural remarks, Molden highlighted the role of the Nepal GIS Society played in the aftermath of the 2015 earthquake in Nepal. Although their own office building was severely damaged, the Society supported ICIMOD and the Ministry of Home Affairs, the Government of Nepal, in mapping disaster-affected areas by mobilizing GI volunteers immediately after the earth quake. He highlighted the contribution of the Society in aiding the development of human resources in GIS in Nepal, by conducting training workshops and talk programmes, and advocating the importance of spatial cognizance. He added that ICIMOD decided to support the reconstruction keeping the Society’s contribution to Nepal in mind. Dignitaries including Upendra Man Malla, former member of the National Planning Commission; Buddhi Narayan Shrestha, former Director General of the Department of Survey, Government of Nepal, and Nepal’s International Border expert; Rishi Shah, scientist at the National Academy of Science and Technology; and Narendra Raj Khanal, Head of the Central Department of Geography, Tribhuwan University, also highlighted the contribution of the Society in the field of spatial knowledge dissemination, capacity building and active action towards the development of GIS in the country. General Secretary of the Society, Govinda Joshi, highlighted the activities of the Society in the current fiscal year. The programme was adjourned after a brief vote of thanks by Ila Shrestha. After the formal programme, all the guests inspected the newly constructed office and training rooms. This was followed by a group photograph.